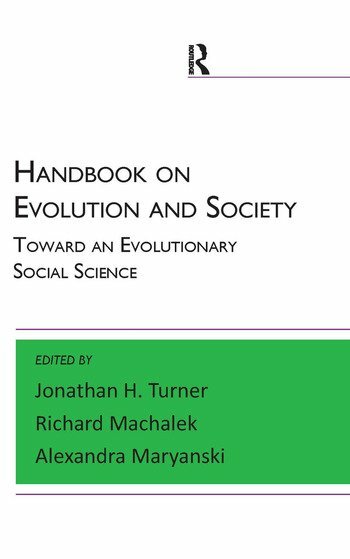 Handbook on Evolution and Society brings together original chapters by prominent scholars who have been instrumental in the revival of evolutionary theorizing and research in the social sciences over the last twenty-five years. Previously unpublished essays provide up-to-date, critical surveys of recent research and key debates. The contributors discuss early challenges posed by sociobiology, the rise of evolutionary psychology, the more conflicted response of evolutionary sociology to sociobiology, and evolutionary psychology. Chapters address the application and limitations of Darwinian ideas in the social sciences. Prominent authors come from a variety of disciplines in ecology, biology, primatology, psychology, sociology, and the humanities. The most comprehensive resource available, this vital collection demonstrates to scholars and students the new ways in which evolutionary approaches, ultimately derived from biology, are influencing the diverse social sciences and humanities. 9 Where Do We Stand with Respect to Evolutionary Studies of Human Behavior? Jonathan H. Turner is Distinguished Professor of Sociology at the University of California, Riverside, and University Professor for the University of California. He is the author of thirty-eight influential books, which have been published in twelve different languages. Richard Machalek is Professor of Sociology at the University of Wyoming. His work addresses the evolution of social behavior among both human and non-human species. His publications have appeared in venues such as Sociological Theory, the American Journal of Sociology, Advances in Group Processes, Rationality and Society, and Advances in Human Ecology. Alexandra Maryanski is Professor of Sociology at the University of California, Riverside. She is the coauthor of four books outlining her approach to a more biological-based sociology, plus another edited book devoted to evolutionary analysis in the social sciences. She is also the author of many dozens of research articles and chapters using data on primates as a lens for understanding human nature and its affects on behavior, interaction, and social organization.